Bertolt Brecht's most heartfelt (and funny) play The Caucasian Chalk Circle, written by Brecht in California while in exile from Germany during World War II, it features music created by the cast and is set in the chaos of southern Russia and the Caucasus Mountains at the end of World War II. 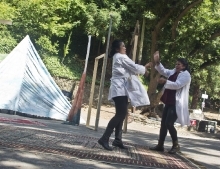 The play takes story elements from the Chinese Play "Circle of Chalk" and the Tibetan Buddhist story "Mahaushadha", with echoes from the Hebrew Bible story "The Judgement of Solomon". The story centers on the peasant girl Grusha, who, while fleeing violence perpetrated in her home city of Nukha, rescues the abandoned child of a member of the ruling class. In her adventures (narrated as a play-within-the-play by "The Singer"), she encounters numerous characters from village and city, including the "corrupt judge with a heart of gold" Adzak and her one true love, Simon. Our production will utilize the acclaimed translation by the husband and wife team of James and Tania Stern, assisted by the noted poet W.H. Auden. Our cast features returning Actors Ensemble members Annika Bergman, Pennell Chapin, Maureen Coyne, Paulette Herring, Joseph O'Loughlin, Jerome Solberg and Vicki Victoria, and newcomers Alejandra Leon, Julianna Fulton, Ryan Gonzalez, Samantha Rasler, Joel Stanley, Miranda Tilley and Matthew Weinberg. It will be directed by Anna Smith, director of the Quinan Street Project, and veteran of a long career in East Bay Theatre. Stage management by Arianna O'Day, costumes by Paula Aiello with assistance from Naseem Alavi, set design by Lisa Sullivan. 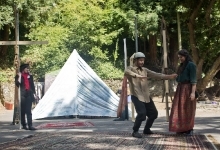 Performances begin Saturday, July 1st at 4 p.m. at John Hinkel Park in Berkeley, and continue on weekends at 4 p.m. through July 16th, with a special performance on Tuesday, July 4th at 4 p.m. 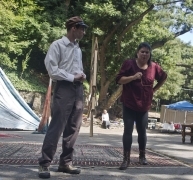 The Knight of the Burning Pestle, adapted from Beaumont by Vicki Siegel, and directed by Lelan Fernando, Aug. 19th-Sep. 4th John Hinkel Park Amphitheatre, Saturdays and Sundays at 4 p.m., special performance Monday September 4th at 4 p.m.